Ever since the 1993 blockbuster Jurassic Park, the possibility of bringing extinct species back to life has been part of our collective imagination. The film, based on a Michael Crichton novel, was itself inspired by actual scientific breakthroughs in the early 1990s that allowed scientists to use DNA from museum specimens and fossils to recreate the genome — or genetic blueprint — of dead animals. When the film debuted the science wasn’t advanced enough to bring back extinct species. But today it might well be, and researchers’ growing efforts to recreate extinct species — in labs from California to Australia — have been making headlines. It isn’t possible to bring dinosaurs back to life, scientists say, because DNA is too degraded after millions of years. But work is now underway to bring back more recently extinct species, including research at the University of California-Santa Cruz aimed at restoring passenger pigeons, and Harvard scientists’ attempts to bring back the woolly mammoth, which QUEST explores in this half-hour documentary, Reawakening Extinct Species. In the 19th century, passenger pigeons were the most abundant birds in the world. Painting “Distant Thunder,” by Owen Gromme. Courtesy Anne Marie Gromme. There are significant practical, ethical, and legal questions yet to be worked out, such as whether de-extincted species would be protected by the Endangered Species Act or would find sufficient habitat in which to thrive. Nevertheless, scientists around the world are moving ahead using three different technologies to try and bring species back. Cloning: In April 1999, scientists in Aragón, Spain, trapped the last remaining Pyrenean ibex, known in Spanish as a “bucardo,” a species of large mountain goat adapted to the snowy Pyrenees, where they traipsed along sharp outcroppings and kept mostly out of sight. Long hunted as a source of protein, by 1989 a census revealed that only six to 14 were left, according to Alberto Fernández-Arias, head of Aragón’s Service of Hunting, Fishing and Wetlands. In 1999, Spanish researchers carefully took skin samples from the last remaining goat’s left ear and its abdomen. They named the goat Celia, and fitted her with a radio transmitter before releasing her back into Ordesa and Monte Perdido National Park. A few months later, in January 2000, Celia was killed by a falling tree. 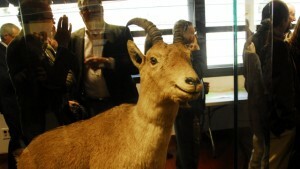 With the species now extinct, José Folch, at the CITA, a public research institute in Aragón, joined researchers from Spain, France, and Belgium to clone the goat in 2002. 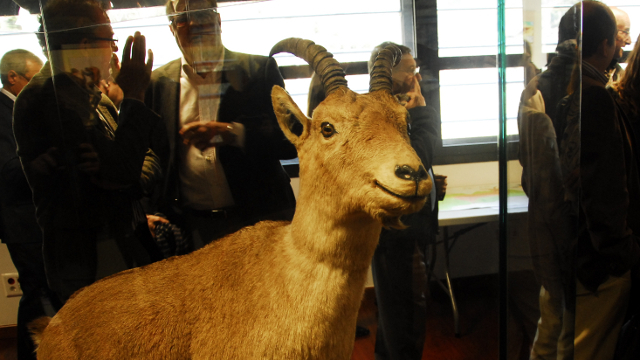 The remains of the last Pyrenean ibex, a female named “Celia,” are in a museum in the Spanish town of Torla. Courtesy Government of Aragón. To clone the bucardo, the researchers defrosted cells they had obtained from Celia’s skin samples. Using technology developed to clone Dolly the sheep in 1996, they transferred the nucleus from Celia’s cells into cells from domestic goats whose nucleus had been removed (a cell’s nucleus contains its genetic material, in the form of chromosomes). They then stimulated the cells with a jolt of electricity and waited to see which ones grew into embryos. They transferred 154 embryos into surrogate mothers, a cross between domestic and wild goats. A bucardo kid was born in 2003, but died after a few minutes from a lung deformity. Folch and his collaborators are repeating their attempt this year and Fernández-Arias said they hope that if all goes well, a kid, or kids, could be born in August. In Australia researcher Michael Archer is attempting to clone the Tasmanian tiger, also known as a thylacine or Tasmanian wolf. This was a unique carnivore that carried its young in a pouch and was hunted to extinction by 1936. Archer, who is based at the University of New South Wales, is also working to bring back the gastric brooding frog. Discovered in 1972, it turned its stomach into a uterus where it gestated its tadpoles, then birthed the baby frogs through its mouth. (In most frogs, females and males excrete eggs and sperm, and fertilization occurs in the water). The extinct gastric brooding frog gave birth through its mouth. Painting by Peter Schouten, courtesy Michael Archer. The frog was extinct by 1983, likely wiped out by chytrid fungus, a disease spread by peoples’ shoes that is decimating frog populations around the world. Breeding: In the Netherlands entrepreneurs at an organization called Rewilding Europe are working to create large wildlife parks in parts of the continent where farmland has been abandoned, such as along Croatian mountain ranges on the Adriatic coast, emptied out during the 1990s wars in the former Yugoslavia. They envision parks teeming with wildlife like bears and wolves, and the aurochs, the ancestor to all breeds of modern cattle. Aurochs were hunted, domesticated, and bred out of existence by 1627. They would have been the only cattle big enough to put up a fight with predators like wolves, said Ronald Goderie of the Holland-based Taurus Foundation, which is working in close collaboration with the Rewilding Europe project. 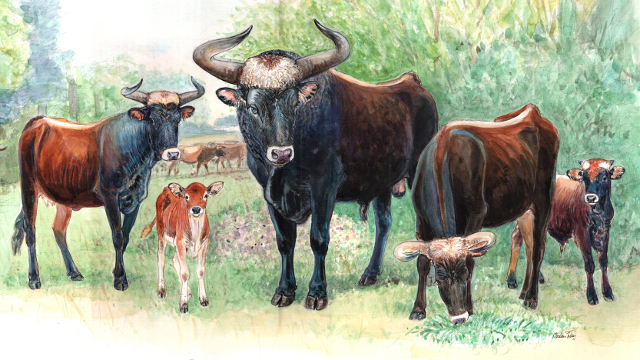 Aurochs, the ancestors of all modern cattle, disappeared from Europe in 1627. Illustration by Marleen Felius, Taurus Foundation. “They want to create something like the game parks in Africa or the national parks in America that will also realize some economic activity,” said Goderie. The idea would be that visitors could go on a European safari. The Taurus Foundation is focused on bringing back the aurochs by working with researchers in Holland, Spain, and Portugal to breed “primitive” types of cattle: breeds that have survived in poorer parts of Europe where modern breeds of cattle aren’t as available. The process of breeding these cattle to make them more like their ancestors is called “back breeding.” The foundation has already produced 150 crossbred cattle, said Goderie. 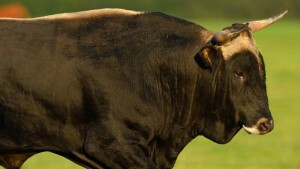 A bull called “Manolo Uno” was bred to resemble an aurochs. Courtesy Staffan Widstrand. The first of these crossbred animals, a bull named Manolo Uno, was created by performing in vitro fertilization using eggs from a Maremmana Primitivo cow from the Maremma region of Tuscany, Italy, and sperm from a Pajuna bull, from Andalucía, Spain. Researchers using genetic analysis have traced both breeds back to aurochs. Maremmanas are similar to aurochs in their thick horns, large size, and coloration (black males and brown females). Pajunas have long faces, like their ancestors. And both breeds live in natural herds and can subsist in harsh conditions. To create Manolo Uno, sperm and egg were joined in a lab by Hurkmans ET, a Dutch company, and the resulting fertilized egg was carried by a surrogate dairy cow. Genome Editing: At the University of California-Santa Cruz, biologists Ben Novak and Beth Shapiro are piecing together the genome of the extinct passenger pigeon. Three to five billion of these pigeons existed in the United States in the 19th century. They are believed to have been the most abundant birds in the world, but they were hunted for food and went extinct in 1914. Novak’s work to bring the bird back is being funded by Revive & Restore, a nonprofit group based in Sausalito, California, co-founded by environmentalist Stewart Brand, creator of the Whole Earth Catalog, and entrepreneur Ryan Phelan, former CEO of DNA Direct, one of the first companies to offer genetic testing online. Passenger pigeon specimens, like this one from the Oakland Museum of California, are all that remains from what was once the most abundant bird in the world. Photo by Arwen Curry, QUEST Northern California. 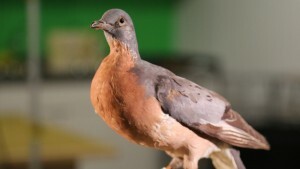 Using DNA extracted from passenger pigeon specimens stored in facilities like Canada’s Royal Ontario Museum, Novak and Shapiro are putting together as much of the passenger pigeon’s genome as possible. Then they’ll compare it to the genome of its closest living relative, the band-tailed pigeon, which is found on the West Coast, in the Southwest, and all the way down to Argentina. 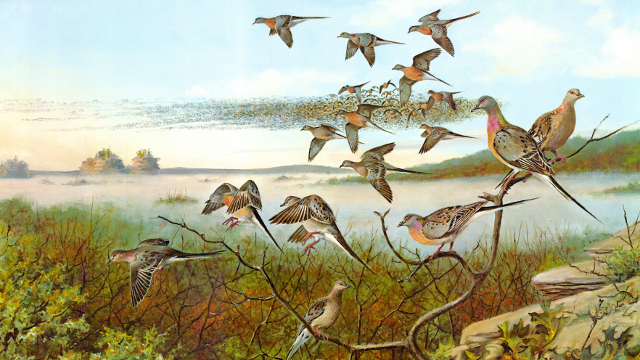 By comparing the two genomes scientists hope to figure out what genes gave the passenger pigeon its physical characteristics, like the long tail and swift wings that allowed it to fly at 60 miles per hour. Once researchers have identified these genes and built them in the lab using chemical compounds, they’ll insert them into the band-tailed pigeon’s genome using new genome-editing technology. “It’s like very precise scissors that allow you to cut and splice with unprecedented accuracy and ease of use,” said Harvard Medical School geneticist George Church, one of the scientists who pioneered the technology, known as CRISPR, in the past year. 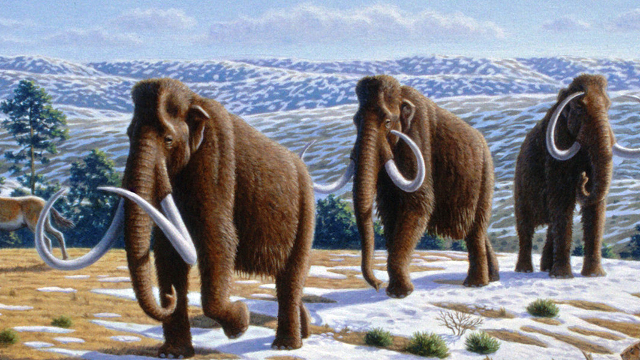 If revived, woolly mammoths could help keep the permafrost from melting, say scientists. 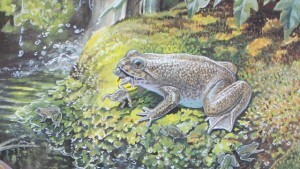 Illustration by Mauricio Antón, courtesy PLoS Biology. In his lab, Church is editing elephant cells to try to make those animals more closely resemble woolly mammoths, with a fatty layer and thick fur to better withstand the cold. Teams in Russia and South Korea hope to clone a woolly mammoth using blood found in fossilized remains. And although it may be years before mammoths roam the Earth or passenger pigeons take to the skies, it probably isn’t too early to start considering the implications. KQED Science associate producer Arwen Curry contributed to this story. Author’s note: This post was corrected on 4/24 to reflect the correct number of bucardos that researchers believe remained in 1989. A census revealed that six to 14 were left, not four. The principal investigator on the cloning of the bucardo is José Folch, at the CITA. That was great, love this article! How can we even think to bring back long extinct animals when so many current animals are challenged for habitat now. These resources should be used to help currently living species, not create new (once extinct) competetors. What I want to know, is how they plan on creating the genetic diversity needed to sustain a species, without serious mutation being produced by using only one source of DNA – in most cases. Second that @ChazSmith:disqus. It is astonishing to think we are ‘considering bringing back recently extinct species’, when we are continually destroying the Earth’s habitat at an alarming rate, barely “conserve” (parks and zoo – to sustain the entire Earth?) what is left, while continually polluting and destroying both land and water habitats. We have to learn some way to live in harmony with all of Nature, including around our home spaces. It seems we are quite short-sighted in how to live more harmoniously. Agreed. We need to spread the knowledge that once they are gone, they are gone. This isn’t only a publicity stunt, you know. there are legitimate reasons ton do this, mainly being that ecosystems cannot function correctly with lost species. Everybody knows, that the autumn landscape in the north woods is the land, plus a red maple, plus a ruffed grouse. In terms of conventional physics, the grouse only represents a millionth of either the mass or the energy of an acre. Yet subtract the grouse and the whole thing is dead. Whats not ethical about fixing what us humans have done? That’s just a excuse not to help.. We are the ones ruining the entire biosphere and hunting entire specie’s to extinction. Half the people around the world could careless about the giant island of plastic in the pasific… Why not care about reversing what we have done?…….. In my opinion as 16 year old the specie’s we need to focus on are the ones who will help the productivity of our devastated world/ ecosystem’s. Also yes save the ones we have hunted, because 1. They represent evolution at its peak until guns/human tools 2. They have vital genetic info that can make better/ more suited animals for the future. And yes save the ones who are being demolished by our pollutents.